UNIVERSITY PARK — Since Penn State joined the Big Ten, much has been made about the Nittany Lions lacking a true annual rival. And while we can split hairs, and have, over whether games with Pitt — PSU’s oldest rival — should be added at least occasionally, there is no disputing that the biggest and most meaningful game on Penn State’s schedule this year and any year is tonight. Ohio State has carried the Big Ten’s torch and will continue to do so until the Nittany Lions can take it from them. Penn State did that two years ago, in stunning fashion, when Marcus Allen’s late blocked field goal and Grant Haley’s return sparked a 24-21 victory over the No. 2 Buckeyes in what was arguably the best regular season home victory in school history. The game was the signature win of the post-sanctions era and became a springboard to the Nittany Lions’ first Big Ten title game (and championship), their incredible showing, even in defeat, against Sam Darnold and USC in the Rose Bowl, their 2017 blowout of Michigan and last year’s Fiesta Bowl crowning. James Franklin takes a bigger-picture look than just the shocker two years ago. Maybe to help build needed confidence for tonight, he cites the one-score difference between the teams in three of the last four meetings, dating back to the 31-24 escape in overtime in 2014. “This has been for four years a great game, a great game for college football, a great game for our conference and a great game for both programs,” he said. Just as the Buckeyes failed to deliver the knockout punch in 2014, blowing a 17-0 lead, and two years ago, when they led 21-7 heading into the fourth quarter, it was Penn State that couldn’t close the door after building a surprising 35-20 lead in Columbus last year and fell 39-38. So here we are again — only this time Penn State rides a 16-game home winning streak and believes more than it did in 2016. “We had been able to compete, but when it came to the top level, we’d be in the game but not able to pull them off,” McSorley said. “That (2016) was the first real big game we were able to pull off. I think it was a growing moment for our program. We’re two completely different teams from that point. And yet Ohio State is still ranked higher (No. 4 vs. the Lions’ No. 9), still favored on the road (by 3.5-4 points) and still the hunted, not the hunter. Even in 2016 when Penn State beat Ohio State and won the Big Ten title, it was the Buckeyes — not the Lions — who went to the College Football Playoff. That’s why motivation here is running at a fever pitch. Franklin has been beating the drums to set a college football noise record. Though he prides himself on tweeting double-digit mentions of the opponent each Sunday, whether it’s Kent State or Ohio State, even he can’t calm the storm. His mail carrier delivered a personal note to beat the Buckeyes so there’s no quelling the reality that tonight is different. “I think it’s a really important day for our football program,” he said. This is the day, or night, when Penn State finds out if it has pulled even with Ohio State as the winner gains an inside track to the CFP. With some legitimate reason, other than his defense that too often this year and for sure against the Buckeyes last year has shown a glass jaw. But the Lions can check some advantages. They’re at home in front of 107,000 in a stoked whiteout. They’ve got McSorley, who is much more experienced than Ohio State’s talented QB, Dwayne Haskins, and who has answered every big-game call. 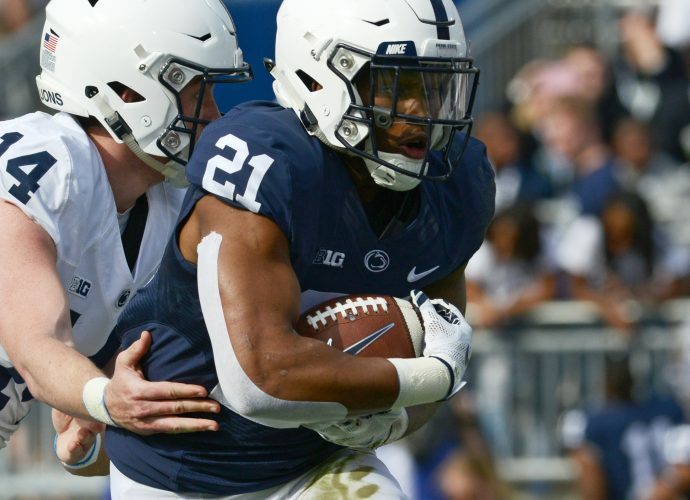 While Penn State’s defense is a major question, it’s not facing the 1985 Bears: Ohio State gave up 38 points to arguably a lesser Penn State offense last year and 55 at Iowa. The Buckeyes are also without their best player tonight, defensive end Nick Bosa, and they spent up until last week dealing with the month-long distraction of Urban Meyer’s suspension. Is Ohio State ripe? Could this be the night Penn State closes the gap?